Happy Bloggers Challenge Friday! Thanks to those who played along with last weeks Alter It Challenge! 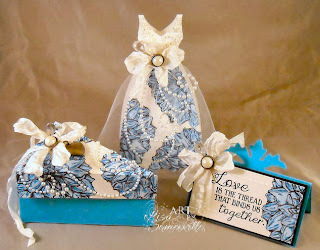 I always love to see what other stampers are altering! I have a cabinet just for my alterable items, thanks so much for the inspiration! This weeks Bloggers Challenge Theme is In Bloom, the challenge is open to your interpretation. I'm thrilled to share my projects with you today, as they are published in the April issue of Crafts 'n Things! All stamps are from Our Daily Bread Designs, colored with STAEDTLER Karat Aquarell Watercolor pencils. All templates are cut using the eCraft; the Bridal Dress and Cake are from Creations by AR, the place card is from Craftwell. For full details on how I created these projects, see the April issue! On a side note, today would have been my Gram's 91st Birthday, Happy Birthday Gram! My Grandmother loved flowers, especially Daffodils! Growing up she had the most beautiful Peonies down the side of her lot, I loved those flowers, but hated all the ants! If you'd like to play along with this weeks Bloggers Challenge, please link back to this post on your blog and mention you created your card for the Bloggers Challenge In Bloom Challenge. Please add your link using the Link Tool below, your link should be a direct link to your Bloggers Challenge Post, use your name as the Title. Please do not link to cards that were created prior to the challenge date. Entries not linking properly, or backlinked will be removed. If you have the captcha enabled on your blog, please consider turning it off, as it makes it so much easier to leave comments. Happy Birthday to your Grandmother :) I love your creation, beautiful colors, beautiful set. What gorgeous creations! Love that flower stamp. Congratulations on your publications! I think Gerrie is so right! My fingers would just not behave! It takes me so long to fussy cut something! These projects are amazing and your grandma would love these blooms! Happy Friday! Beautiful set you created, love those colors and so elegant. It's wonderful that you have so many great memories of your grandmother! These are so pretty, what a beautiful set, and the sentiment on the card speaks of how you cared for yur Grandmother. Gorgeous projects. Congrats on their being published. They are really pretty. I love the Sentiment you used. Peonies are such a pretty flower and yes they can attract ants but the blooms are so worth it. What a lovely remembrance of your Grandma. So beautiful, Lisa. Gorgeous art pieces. Love them. Beautiful projects. Your coloring of that flower is fabulous. I bought the dahlia stamp because of you, but I still have to use it. I love how you use it. I am resisting that flower image- you are not making it easy! LOL Gorgeous project- congrats on Publication! Gorgeous set! Love how you used the pop of blue on your wedding set. What a lovely set! The colors and pearl accents are so pretty. Gorgeous inspiration, its my first visit and I am hoping to join you in the furure. WoW, Lisa, this gift set is stunning!! Who wouldn't love to receive it?! ?